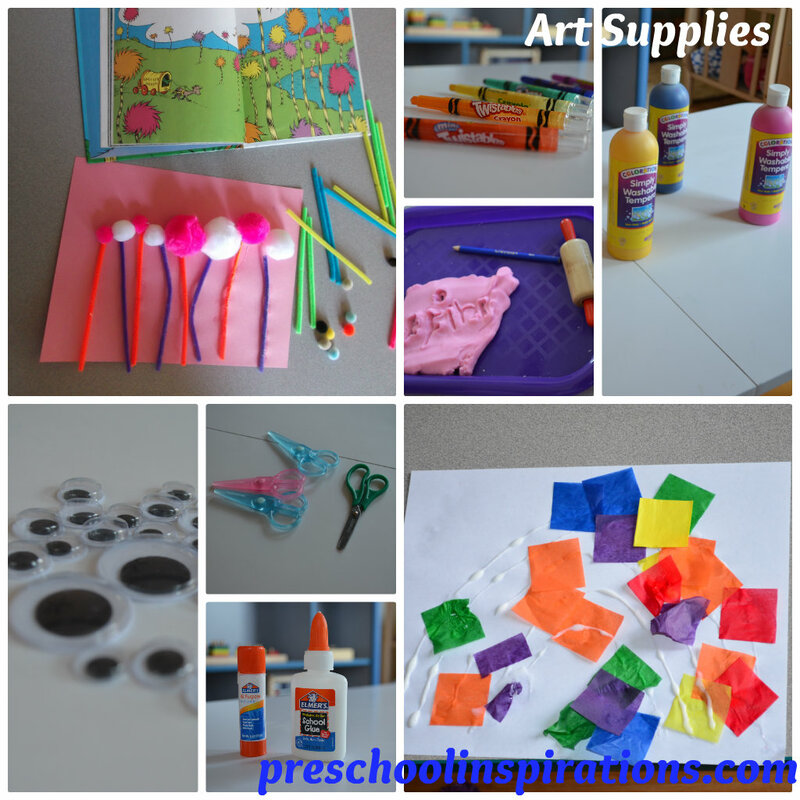 Here are some of my absolute favorite supplies for preschoolers! You can use these in the classroom or at home, and I’ve even included the places that I’ve found the best deals as well as the best brands available where I live. I must admit that I am always super excited when it’s time to buy more supplies for my preschool. When I was an Assistant Director, I had six classrooms that I was in charge of buying supplies for. That was “school shopping heaven” to me! Now that I just have my one classroom, my budget has weaned down substantially. There are certainly supplies that I feel are the best use of our money, so I wanted to highlight them for anyone who is buying for a preschool center, child care center, in home preschool, homeschool preschool, or Sunday School program. This is by no means an extensive list, but it is a bunch of my personal favorites. The first three areas I am going to share about are art, science, and math. To see the rest of the series you can click here: sensory play and fine motor activities, movement and music, and manipulatives and puzzles. Any supplies listed from Discount have an affiliate link. It means that they are products that I absolutely love, and if you purchase through my link, it will help support Preschool Inspirations at no extra cost to you. Some products I buy at other venues, so I’ll be sharing those with you as well. Paint : For liquid paint, my favorite is Colorations tempera paint from Discount School Supply. Of all the paints I used, it is best quality for the price. Other paints I have bought have had an undesirable scent, dried up quickly, or aren’t as vibrant. I’ve also heard from trusted teacher friends that Crayola paints are great too, but I haven’t personally used them. When it comes to watercolors, Crayola wins this hands down! The size of the cakes are much larger than other brands, and they also are the most colorful. These are the paints I use to make one of my other favorite supplies, liquid watercolor. Liquid Watercolor : This is a food coloring substitute, and it is amazing! It is washable, and I almost couldn’t imagine preschool life without it. If it gets on clothes or hands, it comes out much easier than food coloring. And if you want to make your own, find my super affordable DIY recipe here. Some of my friends buy the Sax brand at Amazon and say good things about it as well. When it comes to the tropical colors, it is rumored that Discount has the best ones. They even have glitter liquid watercolor too. I am absolutely hoping this will be in stores one day! Dry erase Crayons: We are huge fans of dry erase crayons because then I don’t have to stress about finding dry erase marker lids and dried out markers. These are also typically available in many stores that sell any school supplies. Easy-Grip Paint Brushes : Just as these claim, they are definitely easy to hold. I prefer the chubby brushes for new or younger painters and skinnier ones as they become more confident in handling the brush. These are also available in some school supply stores, but generally, I only see the skinny ones at local chains. Markers: Go for washable! It will get on clothes, tables, furniture, etc. so there is no need to be stressed about it. These are also found in stores with school supplies. I actually found these at Kroger/King Soopers for $1 during the back to school sale. Scissors: The blue set of scissors pictured below is a perfect “first set” of scissors! They don’t cut clothing or hair, so you can hand a newbie these and have less to worry about. I have never seen these scissors in stores (so if they are in stores, it is a very select few). The lower set of scissors are just plain child-safe scissors, and they are perfect once the child start to masters the opening and closing movement and can be trusted. Those scissors do cut hair and clothes! They can be found at most stores which sell school supplies too. Glue bottles and glue sticks: I am a huge fan of glue sticks since it is easy peasy for a preschooler to use (and less worry for the adult). As far as glue sticks, I’m all for Elmer’s! The other glue stick brands don’t work nearly as well. Trust me, you want Elmer’s. When it comes to liquid glue, I am less picky. I am definitely a fan of the Colorations brand for liquid glue, and the tiny glue bottles are the best for little hands! If you are making slime though, you will need to use Elmer’s. Glue can be purchased anywhere that sells school supplies, although the Colorations brand is specific to Discount School Supply. If you need bulk glue, this is the best deal I’ve seen by a long shot. Glitter paint additive : Okay, so this would be a splurge item. I just love adding glitter to our art supplies, so it’s worth it to us! I purchase “Make it Glitter” at Discount school supply and add it to paint and discovery bottles. I have not tried the shimmer or puffy ones, but they do look very cool! Colorations Extra-Safe Plastic Glitter : Most glitter is a danger to children as it can scratch their eye if it enters it! This is a much safer alternative, and it makes me worry free. More and more craft stores have started carrying plastic glitter, and of course Discount School Supply has an amazing selection of it. Paper: Get an assortment of colors. I usually buy this in bulk at Costco. I like to get tissue paper at the dollar store or Discount School Supply. I especially love the ones that are already cut up into squares! Pom Poms : These are great for so many projects! I buy big bags through Discount School Supply or with a coupon at Hobby Lobby. Pipe Cleaners/Chenille stems : I think that almost any project could use these in some sort of form. Craft stores, the dollar store, and many stores with school supplies carry these, although they may not have the varied sizes and patterns. This is a fun classroom assortment with endless opportunities. Googly eyes : I find these at my local dollar store, and there are fancy ones too with eyelashes and colored eyes (although I wish I could get those ones at the dollar store too). You can find the fancy ones for the best deal at JoAnn Crafts and with a coupon. Discount school supply has even come out with sticker ones — genius! Natural items: I rotate items such as sea shells, rocks, pine cones, leaves, etc. Craft stores will sell these as seasonal items. We have our own class greenhouse, so I do a lot with plants, vegetables, and observing growth. We especially love to plant and grow grass seed which can easily be done in a home or classroom. Tools: These are just items to use to explore what they are observing such as a magnifying glass, tweezers, insect cages, butterfly tents, etc. Amazon has a great selection as well as school supply stores. Photos of nature: Books are a great source for these. I love finding books at the library with actual photographs of what we are studying. My husband and I also love to photograph, and since we live in Colorado, we have lots of opportunities to take pictures of weather, animals, and other natural occurrences such as leaves changing color. National Geographic has some great magazines for children that offer beautiful pictures as well. Some of my nature books have come from Scholastic as well as Usborne. Class pet: Pets are wonderful source of learning for children. I have had classes with fish and guinea pigs, as well as an occasional visit from a class member’s friend from home. I have not had much luck with my last two class fish, so we’ve stuck with class plants for now. Avoid reptiles as they can carry salmonella. Magnets: We are addicted to magnets…floating magnets, using chenille stems as magnets, magnetic discovery bottles, magnetic white boards, magnetic letters, etc. I keep magnetic strips around so that I can make more magnets even. Some magnets can get pricey, so I try to find them second hand or during an awesome sale at a store or on Amazon. Counting Bears : These have been my all time favorite math activity. Oh yeah, my classes have loved them too! They are available at any school supply store and amazon. Number correspondence activities: Many of these can be homemade, or there are tons of printables online for them. The fish one pictured above is from obseussed.com. Learning mats: Scholastic has put out a bunch of great learning mats. We have another one that is patterns too. 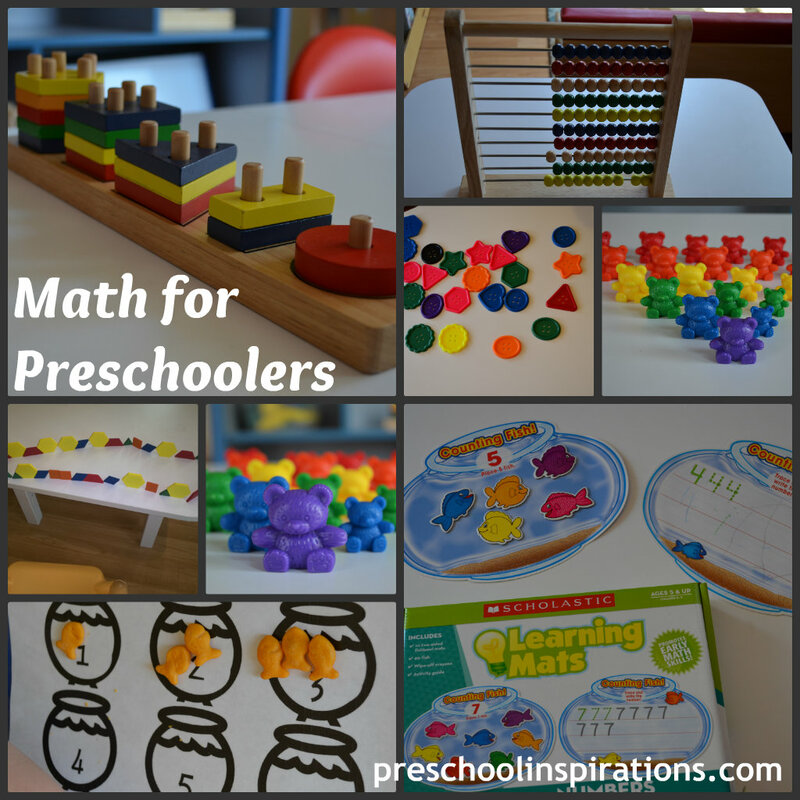 These types of materials can be replicated and teacher made/homemade by laminating a math activity of your choice. I usually make ones for whatever unit we are studying. Sorting activities: Many materials can be used to teach sorting, whether it’s by color, shape, or size. We especially love sorting buttons. Patterns: Typically, lots of sorting objects can be used to make patterns too. We love to make patterns out of our snacks, finger puppets, and of course…counting bears! Here’s how we make our own pattern cards. Shapes: There are some fantastic ways to explore shapes. Pattern blocks and boards supply hours of fun in our class, and we also love shape puzzles. These are at many craft stores as well as places such as TJ Maxx. Counting activities: The most successful way that we have learned to count is through our abacus. We count by 1s and by 10s. This is my “go to” object to see how high each child is counting. I must also admit that we spend lots of time counting to Jack Hartmann’s “Count to 100” song as well. I hope you find these supplies and activities to be a source of inspiration for educating the little one(s) in your life. 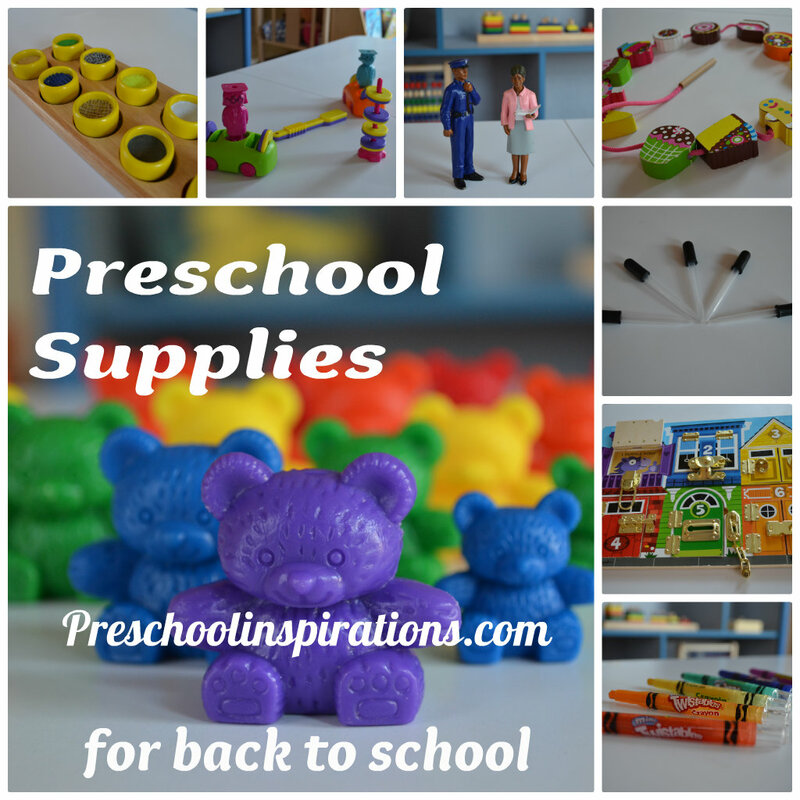 I am looking forward to sharing more activities in the rest of my “Preschool Supplies for Back to School” series. This is a great list! You’ve shared many of our personal favorites, as well! Thanks for sharing on the Discover & Explore Linky! It’s an honor to have you visit Courtney! 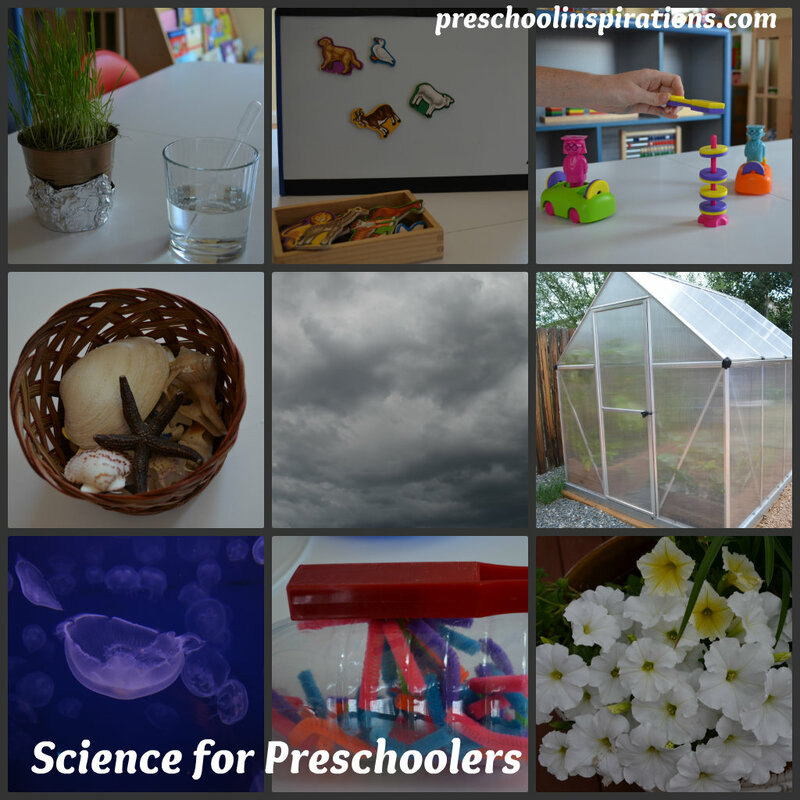 I love all the wonderful resources and ideas I get from teachpreschool.org! What a great list! I really miss getting to order all kinds of supplies back when I taught~ so much fun! That counting bear photo is so gorgeous btw! Thanks so much for linking up to Discover & Explore! You just made my day Chelsey! I had to refrain from making a counting bear collage because my camera just wouldn’t stop taking amazing pictures of them. I’ll probably have to do a counting bears activity post just so I can justify making one :). Thanks so much for visiting my blog, and I can’t wait to dive into your site! A fellow Coloradan teacher — I love it! I have not been to Banks yet, but I will definitely have to check it out. Thanks for visiting Mary, and I appreciate your comment.